Talent agencies are circling Avenatti, who has become a mainstay of cable news. Hollywood talent agencies have reached out to Michael Avenatti, Stormy Daniels’ oft-quoted lawyer, to help him capitalize on his newfound fame, according to several sources in the industry. Daniels and Avenatti have commanded almost nonstop media attention since January when The Wall Street Journal reported that President Donald Trump's personal lawyer, Michael Cohen, had arranged for Daniels to receive $130,000. Daniels has claimed that the money was in exchange for her silence about an alleged sexual encounter with Trump. Cohen has said Trump denies the claims. William Morris Endeavor, one of the most powerful talent agencies in media, has held talks with Avenatti in recent weeks, according to two people familiar with the conversations who requested anonymity because they were not authorized to publicly discuss them. WME’s co-CEO Ari Emanuel represented Trump before he was a political candidate and met with him soon after he was elected in November 2016. United Talent Agency, another of the big four talent firms, is also said by two people to have reached out to Avenatti about representing him specifically. Neither agency would comment when asked about Avenatti. Talent agencies hunt for ways their clients can make money such as book deals, speaking tours, documentaries and films, often signing new and suddenly famous people. Daniels has made a wide variety of media appearances, including an interview on CBS’s "60 Minutes" that attracted 22 million viewers, a bigger audience than the Grammys. Daniels is also set to appear in Penthouse's next issue. She also discussed her desire to make horror movies in a recent appearance on ABC's "The View,” and is still making personal appearances at clubs and running a monthly subscription service for exclusive adult content costing $14.99 per month. 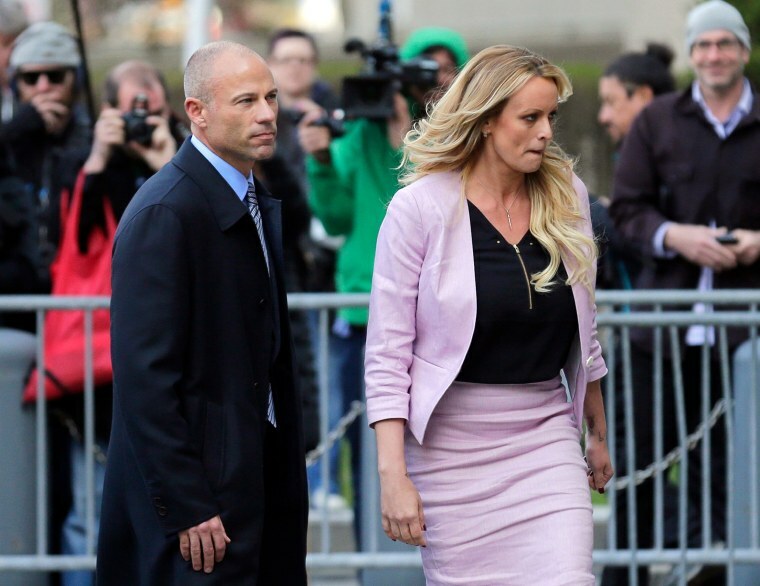 While Daniels has been the star of the saga, Avenatti has become a media darling, appearing on cable news networks MSNBC and CNN on a near-daily basis. He is scheduled to attend the upcoming White House Correspondents Association dinner on April 28 as a guest of The Associated Press. In a phone interview, Avenatti, 47, said he had been contacted by many firms about a variety of opportunities. "I'm very flattered by the outpouring of support and compliments relating to my alleged talent, but at this point I'm far more focused and concerned about seeing this case through to completion and ensuring that justice is done then anything else,” Avenatti said. “There will be plenty of time for other things to focus on when, and if, we are successful." He added: "Make no mistake, we're going to keep our eyes on the prize: truth and justice." In addition to his public appearances, Avenatti has gone after Trump on the president’s preferred turf: Twitter. Avenatti’s account has been particularly active recently, tweeting about his client and Trump multiple times per day. Daniels and Avenatti have rarely missed an opportunity to speak in front of cameras — a strategy that has kept the pair in the news cycle despite any number of other ongoing scandals. The payment to Daniels recently led to a raid from the FBI on Cohen’s office and hotel room, during which a variety of documents were seized. When Cohen appeared in court on Monday in relation to those documents, Daniels spoke outside the courtroom about how Cohen had behaved as if he were above the law. Avenatti was at her side. Avenatti’s biography on his website notes that he’s worked on cases involving socialite Paris Hilton, actor Jim Carrey, singer Christina Aguilera and musician Don Henley. While at the Los Angeles firm Greene Broillet & Wheeler, Avenatti’s bio notes that he worked on “a successful idea theft lawsuit involving the [NBC] reality show ‘The Apprentice’ and its producer, Mark Burnett, as well as Donald Trump.” He went on to form the law firm Eagan Avenatti in 2007. Avenatti and Daniels have concocted a crafty stream of stories to feed the media and keep the spotlight on her. On Tuesday, the two released a sketch of the man who Daniels says warned her in a Las Vegas car park in 2011 not to make trouble for Trump. The stunt was enough to get Trump to acknowledge Daniels and her allegations on Twitter for the first time, calling the sketch a "con job" in a post on Wednesday. James Heidenry, editorial director at Bauer Publishing’s entertainment group, which includes the celebrity-driven magazine In Touch that had the first interview with Daniels, said Avenatti was yet to make a media misstep and has maximized exposure for his client — and himself. "It's fascinating to watch him every night on all the shows,” Heidenry said. “In addition, he's been able to ratchet up the interest week-to-week. He's done a masterful job. It could have easily died on the vine." "He's been beating Trump on Twitter at his own game,” Heidenry said. “Avenatti is the ringmaster and Trump is the tiger."